Stay Tuned for Update 26!! UPGRADES ARE ALWAYS FREE FOR CURRENT USERS!!! Turn your iPhone or iPod into a Handgun or Rifle with the iGun Pro!! To fire, simply hold the handle with the barrel pointed away from you and then flick your wrist back as though you had shot the gun. Every time you flick your wrist, the gun will fire and your empty shell will fly out. You will SEE and HEAR EVERY empty shell as they fall to the ground! NEW!!! 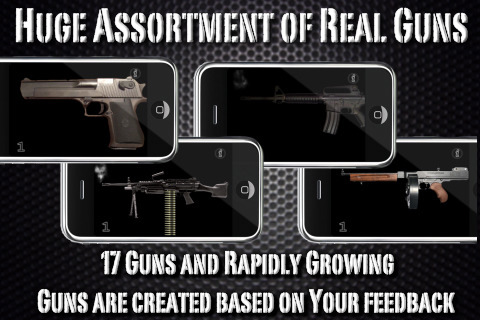 Get detailed information about all the guns included in iGun Pro. Includes cartridge type, effective range, gun history, and more! Double Click the AMMO at the bottom OR point the barrel in the air for a moment. You can also choose from 3 different Trigger Frame settings, just like the real riffles!!! To switch firing modes during use, just touch the bottom left corner.